When the Mikhnevo overpass was built at the 42nd km of the A108 Federal Road (Moscow Large Ring Road), it was impossible to construct a traditional concrete embankment. The specialists were challenged to find a technical solution to implement the project on a limited strip of land while delivering a cost effective and environmentally sound solution over a reinforced concrete retaining wall. The A108 Highway forms the Moscow Large Ring Road and heavy traffic flows are generated by the Moscow, Kaluga and Vladimir regions. In 2012 a Decree was passed by the Moscow Regional Government on the “Road Transport Sector Development and Operation”. A component of this long term strategic development embraced the Governors ‘Free Crossing’ project; where the road crossed the Moscow Railway tracks, the congestion was at its worst, and a program of overpasses was started. 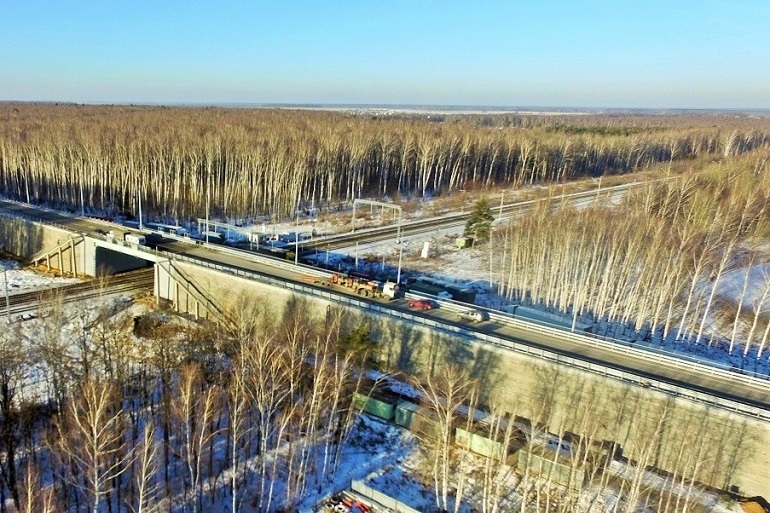 At km42 of the A108 Federal Road, between the Ryazanskoye and the Kashirskoye Highways a road/rail overpass was required. Due to the limited construction area, it was impossible to construct a sloped embankment. Therefore, the project team was challenged to find a technical solution to implement the project on the limited strip of land while delivering a more cost effective and environmentally sound solution compared to the traditional solution of a reinforced concrete retaining wall. Our MacWall soil reinforcement system was chosen to construct the overpass. The implementation of our retaining structure on a limited strip of land was made possible by using polyester geogrids to reinforce the backfill soil layers, allowing the ground to stand at a near-vertical angle. 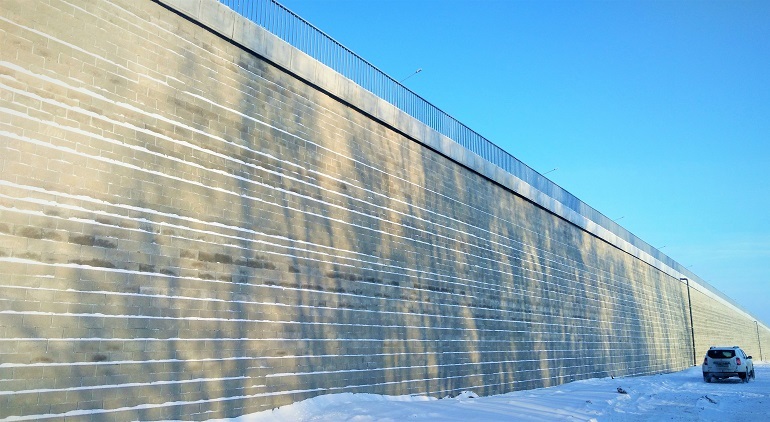 MacWall is a segmental blockwork retaining wall system combining the aesthetics of masonry walls with the engineered reassurance of reinforced earth. The concrete block fascia is combined with MacGrid and ParaGrid geogrids compacted within the structural soil backfill to ensure high load capacity and structure durability. It is increasing in popularity due to its ease of construction, cost-effectiveness and versatility. The overpass solved the congestion problem and helped address a number of other public transport issues including improved safety with the installation of 63 lighting columns and safety rails. light posts and guard rails were installed for safe and comfortable driving, barrier railings were installed along the highway. The overpass now enables vehicles to travel at the design speed of 120 km per hour. The Mikhnevo Overpass is not the only structure where we have used our MacWall soil reinforcement system. Over the past few years, dozens of road construction projects have been implemented in Russia using this technology. Our engineers are ready to provide expert support to our customers at the design stage. They can perform structural modeling using our MacStars W software, which allows for the calculation of internal and overall stability of a retaining structure and also takes into account seismic loads. Therefore, we are able to choose optimum design solutions, which are both technically and economically feasible.